This annual lecture is used to gain a greater understanding of questions of economic justice and how the profit-seeking activities of private firms might also serve broader social goals. To use his words, "capitalism's uniqueness in history lies in its continuously self-generated change, but it is this very dynamism that is the system's chief enemy." 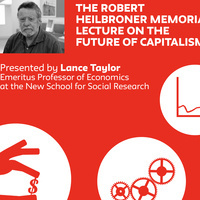 Lance Taylor, Emeritus Professor of Economics at the New School for Social Research and the former Arnhold Professor of International Cooperation and Development, will discuss "A Great Deformation: Fifty Years of Regressive Redistribution in the US Economy." This event was formerly titled "A Great Deformation: Sectoral Stagnation, Flat Productivity, and Lagging Wages." The distributions of income and wealth in America have become more unequal over the past 40 years. The standard Solow growth model, the “double movement” against pure laissez-faire envisaged by Karl Polanyi, and the shifts in the structure of production proposed by Arthur Lewis are all running in reverse. Given the underlying causes and dynamics, turning these trends around could require decades. In 1963, Robert Heilbroner earned a Ph.D. in Economics from the New School for Social Research, where he was subsequently appointed Norman Thomas Professor of Economics in 1971. He taught at The New School for the next 20 years. Each year, SCEPA hosts a lecture by a distinguished scholar on long-term economic trends to honor Heilbroner's life work.